Book: Religion and Human Rights - John Witte, Jr. The relationship between religion and human rights is both complex and inextricable. While most of the world's religions have supported violence, repression, and prejudice, each has also played a crucial role in the modern struggle for universal human rights. Most importantly, religions provide the essential sources and scales of dignity and responsibility, shame and respect, restraint and regret, restitution and reconciliation that a human rights regime needs to survive and flourish in any culture. 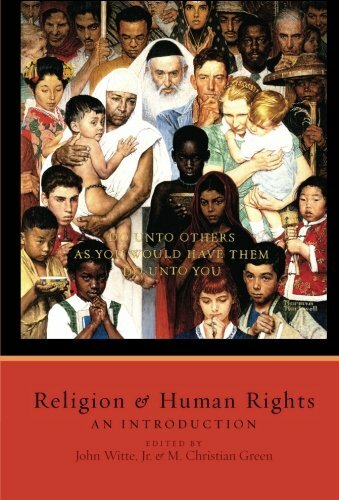 With contributions by a score of leading experts, Religion and Human Rights provides authoritative and accessible assessments of the contributions of Judaism, Christianity, Islam, Hinduism, Confucianism, Buddhism, and Indigenous religions to the development of the ideas and institutions of human rights. It also probes the major human rights issues that confront religious individuals and communities around the world today, and the main challenges that the world's religions will pose to the human rights regime in the future. 22. Patterns of Religion State Relations –​ W. Cole Durham, Jr.
"This splendid volume is a treasure house of insight and up-to-date information on religion and human rights. The accessibility of the essays, the eminence of the diverse authors, and the vision of the editors will make this an indispensable handbook for every scholar, advocate, and policy-maker in the field." "An important contribution to the study of twenty-first century challenges in the field...an excellent handbook and comprehensive survey of the subject."